3.	as a way to 'teach a lesson' to political opponents; opposition student activists; newspaper Editor; or any other person who members of the political or law enforcement elite consider a 'threat' to the 'stability of the country'. There is a basic pattern leading to the torture of an accused person. He is first arrested by the police and may receive a few slaps or kicks during that time, including a fair amount of verbal abuse. He has to be presented before a Magistrate within 24 hours of his arrest. In court, the police may ask for anywhere between 3 to 15 days remand in order to 'question' the arrestee. Remand is what all detainees fear. It is during that time that they are beaten, intimidated, given electric shocks, kicked and verbally abused in order to extract a statement that may lead to a confession and a quick solution of the crime. Family members often bribe or offer money to arresting officers as a way to prevent the physical and verbal abuse that comes with being taken into remand. Again, there is always the fear of the police seeking a further period of remand if the accused does not confess the first time round, and this also encourages the accused to make a statement. In the eyes of law enforcement it seems to be vital that an overworked, under-resourced, badly paid police force, resort to torture and degrading treatment in order to hasten their investigation. Cruel and inhuman treatment and torture are also used by law enforcement to demoralise, scare and stop the activities of specific groups of individuals, such as journalists, political activists (belonging to the Opposition) and even human rights defenders. There have been times, especially during the State of Emergency, when newspaper offices have been monitored and their reports closely censored and journalists threatened and tortured for exposing flaws in law enforcement or for criticising government actions. Apart from the Constitution of Bangladesh, no criminal law in the country has specifically mentioned, defined or condemned 'torture', which is why it is so easy to get away with, backed up with corruption, lack of political will and excuses such as 'part of law enforcement' or downright denial that such incident took place. 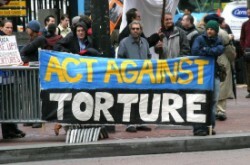 According to Article 35 of the Constitution, “No person shall be subjected to torture or to cruel, inhuman, or degrading punishment or treatment.” If this is the case, then acts of cruel, degrading and inhuman treatment by law enforcement agencies can be taken to court as being in contravention with Constitutional guarantees. --Any hurt that endangers life/causes the sufferer to be in severe bodily pain for 20 days or more. All of the above may also be caused as a result of torture or acts of cruel or inhuman punishment and fall well within the international definition of torture. In fact, many of the abovementioned 'grievous hurts' permanent loss of hearing, fracture or dislocation of bone or tooth, destruction or permanent privation of the power of any member or joint and any hurt that causes the sufferer to be in severe bodily pain for 20 days or more are common complaints by victims of police abuse. Furthermore, the Penal Code 1860 states that it is a criminal offence to cause hurt or grievous hurt in order to extort a confession or information leading to the detection of an offence or the restoration of any property or valuable security or to extract information which may lead to such restoration. However, law enforcement officers in Bangladesh find it easier to cause grievous hurt to a suspect or an accused person in order to extract a confession or information leading to the 'detection of an offence' or the 'restoration of property or valuable security' in order to solve their cases quickly. Therefore, even though the term 'torture' is not mentioned in the Penal Code 1860, it is very much implied therein. Very few legal safeguards are upheld in practice, including the right of information as to the reasons for arrest, the right to legal representation, the 24 hour time-limit for a judicial hearing after arrest. There are also cases of intimidation of the victims and witnesses and there are extreme time delays in forwarding indictments and during trial. The lack of these basic safeguards is a contributing factor to torture. There is another catch to catching a police officer for perpetrating acts amounting to 'torture'; or for that matter for prosecuting a magistrate who allows remand knowing full well what the result will be. According to section 197 of the Code of Criminal Procedure, in order to prosecute a Judge, Magistrate or a public servant who 'cannot be removed from office without government sanction' for any offence committed during course of official duties- needs prior government sanction. We all know how difficult obtaining that will be! The author is Associate Professor of the School of Law, BRAC University, Dhaka, Bangladesh. From next issue we will have 'Your Advocate' column weekly and Barrister Tajib-ul-Alam, Advocate, Supreme Court of Bangladesh has joined us to response your query in this regard.